S’mores without the campfire! 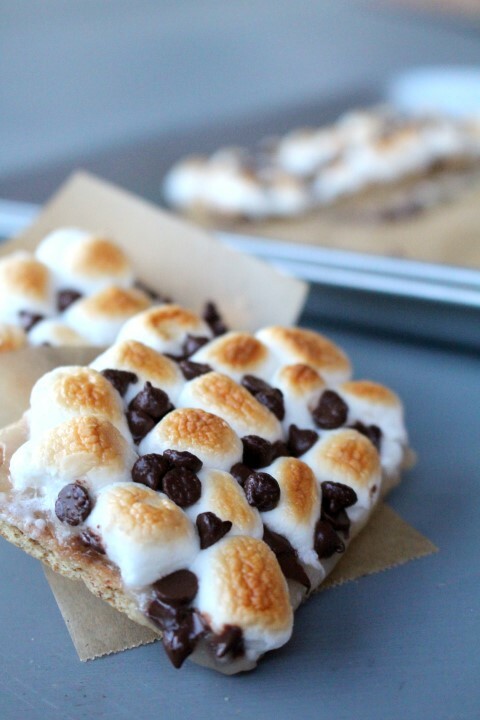 These 15 minutes s’mores squares feature all the chocolaty, gooey, and toastiness of the classic campfire treat. Back to my s’more cravings. 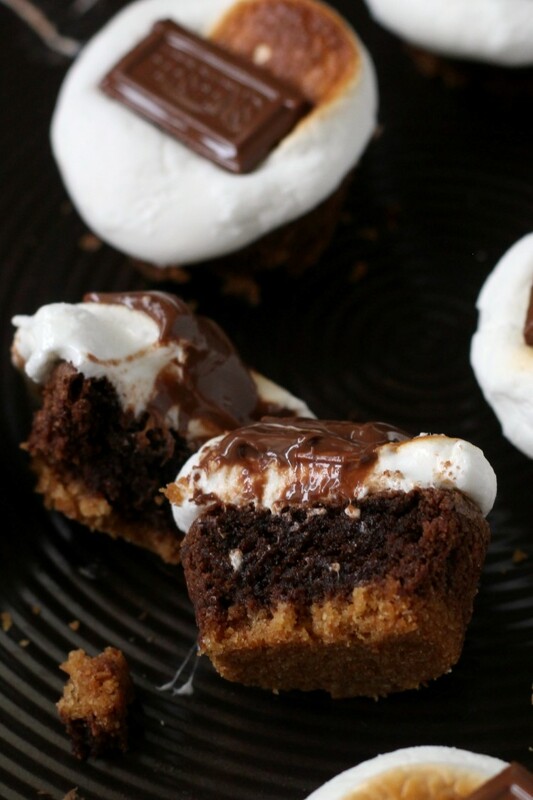 (If you missed the first round, you can find my first s’mores treat here.) I was going to post this recipe yesterday evening. However, when I asked Tyler if he thought the pictures were blog worthy, he advised me to make another batch and re-shoot the pictures the next day. I naively took his advice, but as we were going to bed he casually mentioned that he thought the pictures were actually good enough and he thought that it was a good way to convince me to make them again. Well, it worked and today I made the third batch in almost a week’s time! Look at all that gooey goodness! I think I can convince you to make them with pictures alone. They start with a traditional layer of graham crackers. Next, spread a bubbling mixture of butter and sugar over them and they are baked for 6 or 7 minutes. 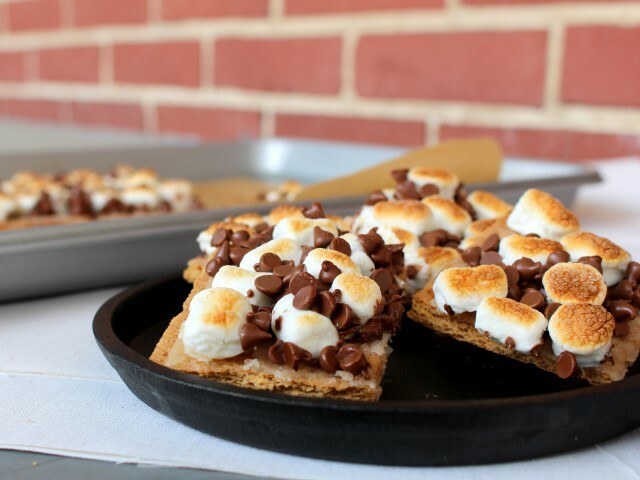 This extra layer of butter and sugar makes them 10 times better than a regular s’more as it caramelizes on the cracker and serves as the glue to hold on the marshmallows and chocolate chips, which are generously sprinkled on top. In the three times I made these, I used a combination of both milk and semi-sweet chocolate chips. Feel free to use whatever kind you have in the cupboard, although milk chocolate makes them much more traditional. My favorite part is the toasting of the marshmallows (besides eating them :). There is something fascinating about watching a marshmallow turn golden brown, and I am highly recommending that you watch yours too. I put them on the highest rack under the broiler to give them their beautiful golden brown color and it takes less than a minute. Thirty seconds to long and they will be black. I stand over the oven with the door open watching until they are the perfect shade. They are the best when the are served warm straight from the oven, but the are still delicious for breakfast the next morning. Preheat oven to 350 F and line a baking sheet with parchment paper. Lay out the graham crackers on the parchment paper in a single layer. In a small saucepan, melt the butter and sugar over medium-high heat and bring to a boil. Boil for 1 minute stirring constantly. Pour the bubbling mixture over the graham crackers and spread around with the back of the spoon. Bake in the preheated oven for 7 minutes. the mixture will bubble up. Remove the sheet from the oven and immediately turn on the broiler, moving the oven rack up to its highest position. 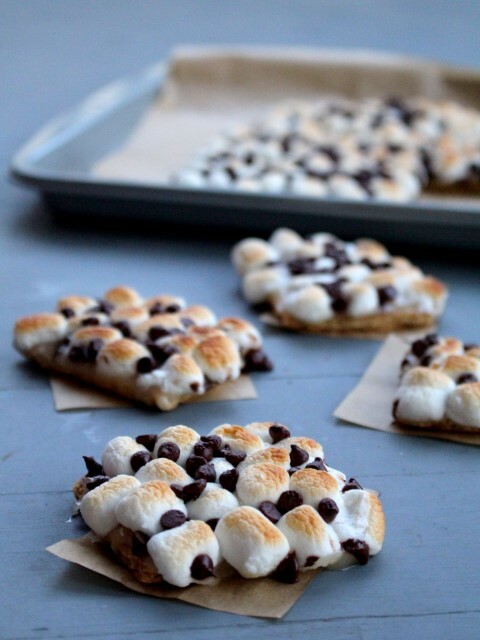 Sprinkle the the graham crackers with the marshmallows and chocolate chips. Place them under the broiler for 30-60 seconds until the marshmallows are golden brown. Watch them closely or they will burn. Let them cool enough to touch and enjoy them while they are still gooey. Delish Mallory! I could so use a bite of that right now! Thanks, Melanie. They are super quick treat. I seriously LOVE this recipe! Great share friend! Thanks, Beth. 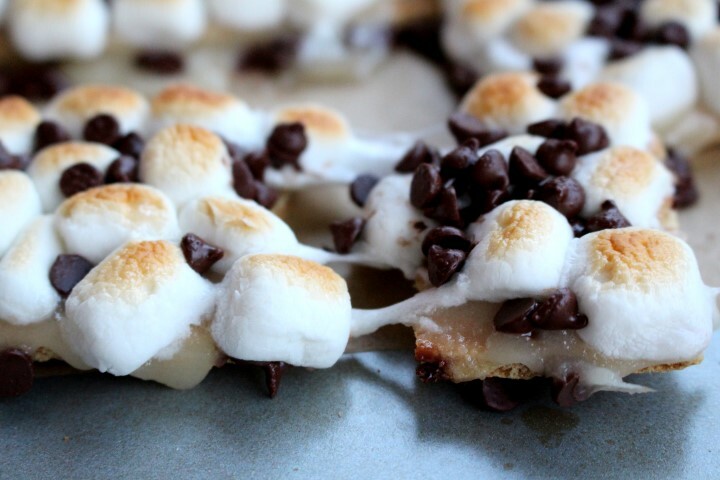 It amazing how chocolate and marshmallow just taste so awesome together. Oh man, these look heavenly!! I simply cannot resist a smore! These look absolutely delicious! I love smores, but it’s too hot in FL to make them outside lots of the year. So… this looks like a great alternative. I’d be thrilled if you’d link up at this week’s Off the Hook! How sneaky of him! But either way, these photos and bars look so good!! Perfect summer BBQ treat! I love all things smores! I cannot wait to try these. Will be pinning for later! I love how easy these are to make!! Pinning your yummy recipe!! Looks good! I would love it if you joined and contribute your awesome posts at my link party at City of Creative Dreams, starts on Fridays 😀 Hope to see you there at City of Creative Dreams Link Party. Love this! My boys have been eating the s’mores ingredients out of desperation for the campfire dessert! With 95 degree days, we won’t be doing the real thing for a while. Thanks for sharing. Visiting from SitsSharefest! thanks for joining the mixer!